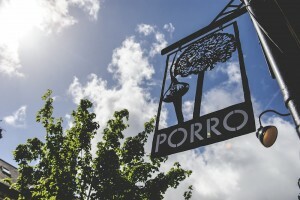 Porro is located in the bustling areas of Llandaff High Street, close to the famous Cathedral. Cardiff is a great place to live / visit and we’re proud to be located at the heart of a couple if it’s most historic and beautiful areas. Situated on Llandaff High Street, we’re easy to find with taxis and bus stops pretty much outside the door. We’re lucky enough to be surrounded by other great local businesses, all helping to give the High Street it’s welcoming charm. It makes for a popular little spot and with convenient bus stops and parking, there’s always a friendly bustle about the place. There is a large car park off the High Street, with spaces also available around the corner on The Green. A Pay and Display system allows free parking in the car park for one hour, and then a small charge per hour. We are wheelchair friendly with full ground floor disabled access and toilets. Please make us aware of any specific requirements you or your guests have when making a reservation so that we can ensure you have the most enjoyable experience with us possible. Now that you know where we are, we'd love to ply you with great food and drink!